I'm attempting to replace the driver's side seat belt on a 2005, Chevy Tracker, due to it permanently locking and not coming unstuck. 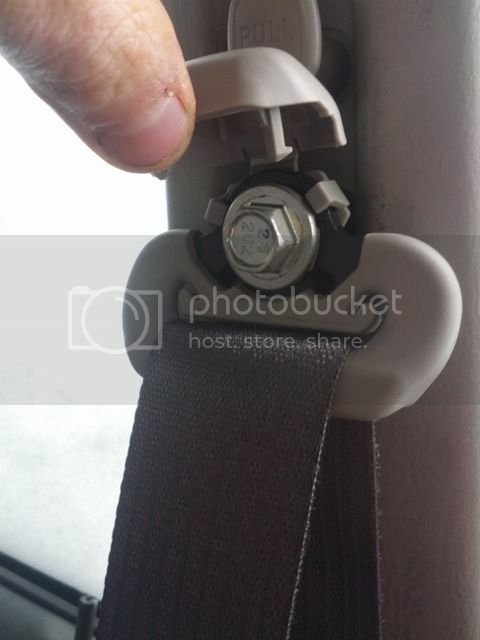 The entire seat belt is being replaced, including the retractor and locking mechanism, not just the 'belt' itself. We've already tried all the troubleshooting for getting the belt to 'unstick' and nothing has worked. Here is where I have encountered tremendous difficulty: I have it almost removed, with the exception of the top 'point' so to speak. The plastic panels have been pulled off, the 2 bolts and 1 screw have been removed from the retractor, so now the retractor and belt are dangling from the top anchor point clip. I apologize for not using the correct terminology as I am learning this as I go. I'm not sure what this is called so will describe it: It is a plastic clip, at your shoulder/head level depending on height when seated, where the seat belt runs through a plastic clip that is attached to the inside point of the car between the driver's side front and back doors. For the life of me I cannot figure out how to get this plastic clip off, or how to get the seat belt to be removed through it. So basically the whole seat belt is just dangling from this clip part, and I have yet to get it off. Any ideas on how this comes off? IIRC there is a plastic cap that flips up and the bolt holding it to the pillar is under the cap. Thanks GC, where is the plastic cap at though? The plastic piece we're having an issue with is all one piece, with nothing that flips up that I can see. This is also my first time replacing a seat belt so that may be part of the issue. I might be wrong.. I have a tracker here to look at, not same year, but Ill go check. Thanks GC. We have it now. Our car is so old the plastic part of the clip had actually melted together where it was supposed to unhook, which was the problem and why it looked like one fused piece. I was able to pry it off so it's changed now. Thank you again! Looks like this. But you've got it anyway. Figured I'd post the pic for future reference. BTW good choice on replacing everything. You cant unstick a seatbelt and expect it to perform correctly in an accident. Those trackers are horrible about rusting on the rockers and allowing dirt and moisture in behind the trim panels to wreak havoc on the retractor. Wow, thank you for taking the picture of it. That's exactly what had melted together. We live in a colder state so I was pretty surprised that it had gotten hot enough even to melt! When I took it out that's also exactly what the problem seemed to be - the rest of the car is clean, but behind the paneling there was so much dust and random crumbs that they must have gotten into the retractor. (exterior, below the door) and see if they are rusted out. If so, you could be looking at doing this again soon. Get the rocker sealed up so it doesnt ruin another retractor. Thanks for the advice! I took a look and they're incredibly rusted out so I'll definitely be sealing that! I never would have thought of that so thanks.